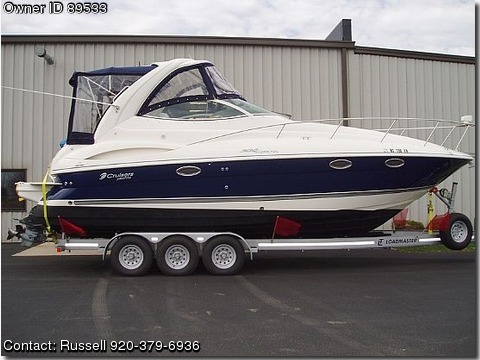 This 2005 Cruisers Yachts 300 Express is a CLEAN well taken care of boat. The twin Volvo 5.0 (270 HP each) with duo-prop stern drives are the perfect power. This boat cruises comfortably 28 mph with a top speed around 42mph. These engines only have approximately 225 hours on them. The boat has a Kohler 5k generator (approximately 225 hours), anchor/windlass, two sets of canvass (one camper canvass and one “sport back” canvass – this one goes from the hardtop and slopes back towards the aft end of the boat), walk thru windshield, drivers windshield wiper, VHF radio and antenna, Furuno color radar, Garmin GPS and a 2008 Loadmaster tri-axle trailer (rated for 18,000 pounds) – electric brakes on all three axles. COCKPIT – Single helm chair (that swivels) to starboard with a cresent bench to port that holds 3 adults comfortably. Aft bench also holds 3 adults comfortably. Mini refrigerator/freezer and cold fresh water sink make up the cockpit’s wet bar. Clarion stereo (located in the Salon) with 4 Sony speakers allow everyone to hear the music without having areas that are too loud or too quiet. There is a Clarion wired remote at the helm to control the Clarion stereo. The helm as all the instruments that you would expect for a dual engine set up, along with a color GPS and color radar. There is also an external VHF radio speaker at the helm. The removable cockpit carpet is in good condition. SALON/GALLEY - is roomy and open. 12,000 btu heat/air with ducts in the head, galley, forward and mid berths. The galley has a mini refrigerator/freezer, single burner electric cooktop, plenty of storage and single stainless steel bowl sink with hot/cold water and a sprayer. The dinette is a booth style with a cherry table and fits a family of 4. There is storage under one bench and the other is where the heat/ac is located. The dinette converts to another berth (using an included filler cushion) that would fit a child. There is a 15’ LCD television that is on an articulated arm which allows you to watch tv from the forward berth or from the dinette. Removable carpet (and stair) runners are included. Owner installed grab-rail assists people when using the companionway stairs. FORWARD BERTH - sleeps 2 adults comfortably. The forward berth has a lighted hanging locker, reading lights, one 110-volt outlet, one 12-volt outlet and a privacy curtain. There is a storage area underneath the bed which works perfect for storing bedding/linen. MID BERTH - is a full time berth that sleeps 2 children. The mid berth has a hanging locker, a small bench (with storage below) for sitting, privacy curtain, reading lights (port and starboard) and two 110-volt outlets (one port and one starboard).